Bitten by that creative Spider: Crazy Courgette Time! And a way to treat for Mildew without Chemicals! Crazy Courgette Time! And a way to treat for Mildew without Chemicals! Courgette, Zucchini, summer squash, green squash.... it is a green (and sometimes yellow) delicious health bomb that comes with many names. Courgettes are easily grown in pots or in beds. This makes them probably one of the most home grown veggies around the world. They are rich in Vitamin C and also contain some Vitamin B6 and depending on the richness of your soil can contain around 4% of Magnesia and they are also high in potassium. It is very much liked in healthy diets for its low calories. There are many myths on Pinterest and other social networks about growing them. I tried a few of them and wanted to share my experiences. First of all there is this myth about pinching off all the first flowers it grows, in an effort to make bigger and healthier and therefor more productive plants...well let me tell you, I tried that with 3 of my courgette plants this year, and they are all 3 small and measly and have mildew. 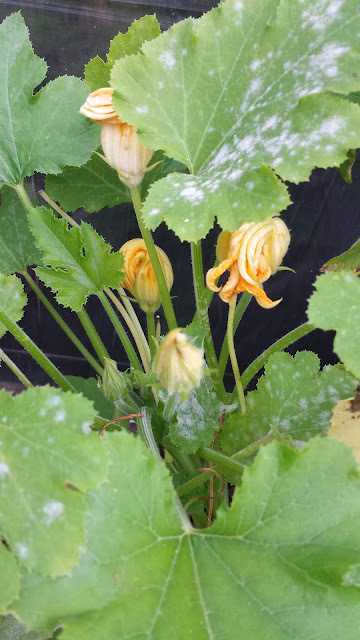 I left the flowers on two of my plants and they were much bigger and have produced most of our courgettes so far! They also have a touch of mildew but not as bad as the ones with pinched off flowers to start with. Mildew is often caused my draught and/or heat, we definitely didn't have any heat hear this year, but I think my neighbour didn't water them very well while we were on holidays and they didn't get much rain. So I put the mildew down to this. I had some last year, too. From my experience the following steps work best to treat mildew without chemicals! First remove the worst looking leaves! Put them in the bin not in your compost! The rest you spray with the following mix. 1 part of milk. The milk has to still have live cultures. Using any type of longer lasting milk will not work. Buttermilk or whey also works, but it has to be one with live cultures! And 9 parts of filtered cold water. This means for 1 litre of solution you need 100 ml of fresh untreated milk or buttermilk or whey and 900 ml of filtered cold water! Pour it into a spraying bottle and spray all infected leaves every day for one week, next two weeks 3 times a week and after that once a week should do. The lactobacillus in the milk will fight back the blight and keep it at bay! At the end of the season make sure you discard plant and soil into the bin and not into your compost! You want to make sure not to cultivate the mildew for the following year! There are 2 types of mildew that courgettes can get infected with. I only have experience with the powdery mildew type (Erysipelas). You can recognise this one by a white powder type of fungal growth on the top of the leave. Make sure your Courgette plants are regularly watered! 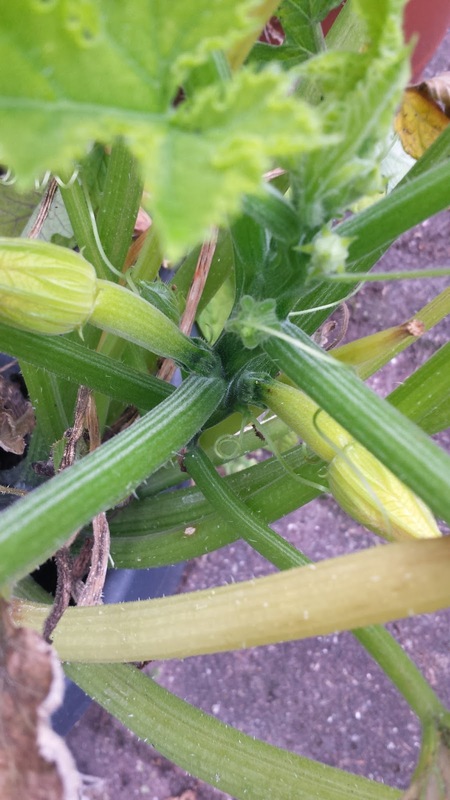 Another problem that can occur is that your plant only produces male flowers, but no female flowers that will actually grow into courgettes. Now, while the flowers are very tasty too and can be used in many different ways, you for sure want some courgettes to show off your grand gardening skills! This phenomena occurs if the plant itself is stressed somehow. This can be caused by too much water or over fertilising or too little water. Rethink your steps and take a close look at your plant to figure out what caused it in your plants case! How do you distinguish between a male and a female zucchini flower? Well, it is very easy! Male courgette flowers grow on a long very thin stem. You can see 3 of them in the above picture. Female courgette flowers have a teensy wee courgette as a stem. (much thicker and shorter than male flowers!) See 2 very young ones in the picture below. These really are the only two problems I ever had with my courgette plants. Did you have any? If yes, which ones and how did you treat them? I would love to hear! PS: if you have a flood of Courgettes and can't think of anymore uses for them, stay tuned as I will be sharing some nice recipes next!